• Water pumping, drawing water from creeks or rivers. Monaro Turbine Specialist along with Arta Pty Ltd have developed a new small scale hydro electricity generator. This affordable new system is particularily suited to low head hydro electricity generation. 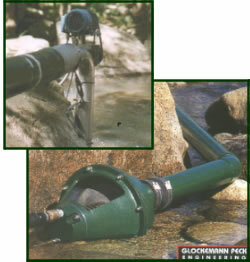 The Glockenmann Pump is a water pumping system that uses water to do the pumping. Thats right no electricity or generator required, the energy from the water flow is used to then pump more water. All you need is a creek or river, it even works in low volume creeks. Unwanted human waste can turn into useful fertilizer with a composting toilet. Water demand and maintenance is greatly reduced by the natural process of aerobic decomposition.